ìEvery single pixel matters if the operator of the vehicle, such as a reconnaissance plane or drone, is going to accurately determine whether a target is friend or foe,î comments Selwyn L. Henriques, president and CEO of EIZO Rugged Solutions. The EIZO Rugged Solutions Condor VPX-H265-SDI is a rugged 3U VPX H.265 High Efficiency Video Encoding (HEVC) video/audio encoder featuring dual 3G-SDI inputs and support for CoT (Cursor on Target), KLV (Key Length Value), and VANC (vertical ancillary data) metadata insertion Information such as a planeís GPS coordinates, speed, altitude, and other closed caption data can be streamed efficiently in non-picture regions of the frame. 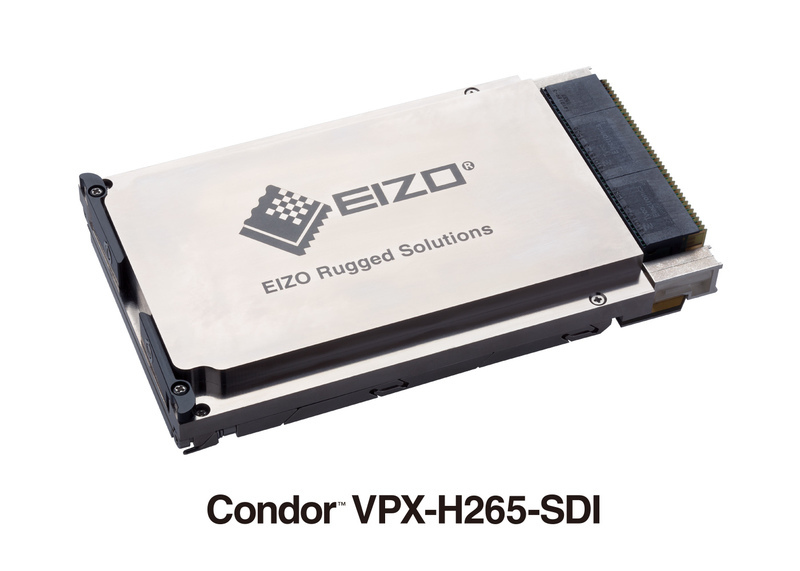 The Condor video encoding and streaming solution is designed for harsh field environments such as manned and unmanned airborne applications where low-latency encoding, streaming, and low power consumption are essential. ìFor airborne applications, this contextual metadata is a key requirement and without it, operators or analysts cannot make informed decisions,î adds Henriques.